The success of any training program is reflected by the success of its graduates. We are proud of our graduates' academic achievements and the standard of medical care they provide their communities. Our program graduates have consistently maintained a high pass rate on the American Board of Internal Medicine (ABIM) certifying examination. Congrats to the Class of 2018 for a 100% Board Pass Rate! Many of our graduates enter a career in general internal medicine and others choose the increasingly popular hospitalist track. 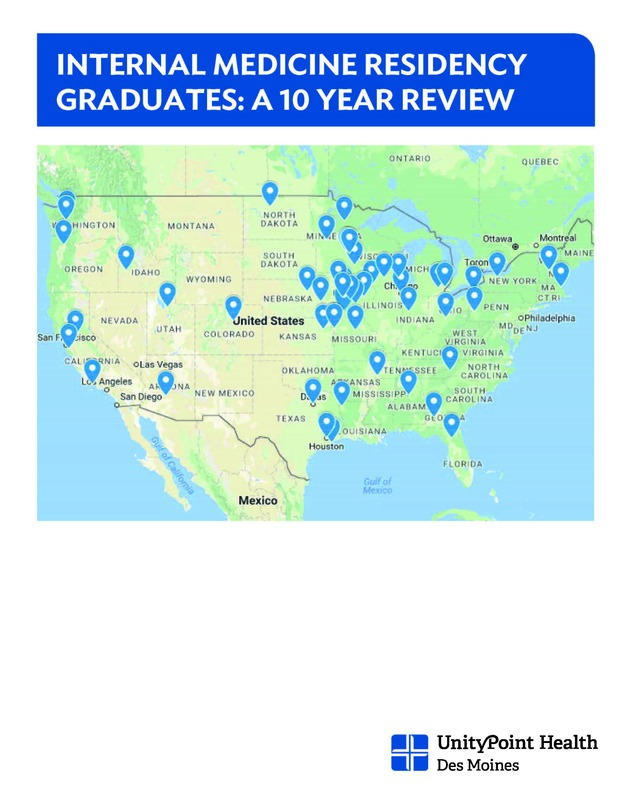 Over 30 percent of our graduating residents have chosen subspecialty careers and recognize the University of Iowa-Des Moines program has prepared them well for fellowship training. A number of our graduates choose to practice in larger cities and in larger groups, but some have also chosen smaller practices in rural settings. Thus, our graduates can practice a variable combination of ambulatory care, consultative and critical care medicine. Learn where our recent graduates have gone after graduating from our program below.